13' W x 28' L x 10' H steel frame? 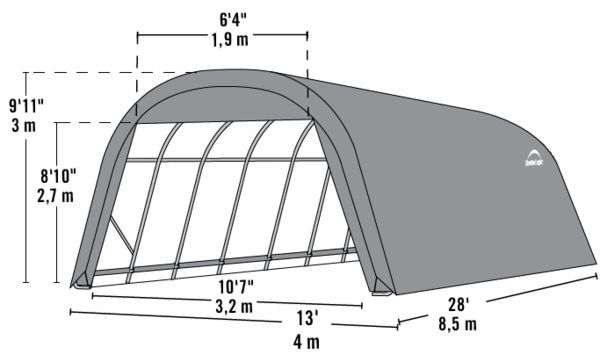 The Shelter Logic 13 x 28 x 10 Round Portable Garage Canopy features a frame of welded 1 5/8 inch diameter 17 gauge steel. 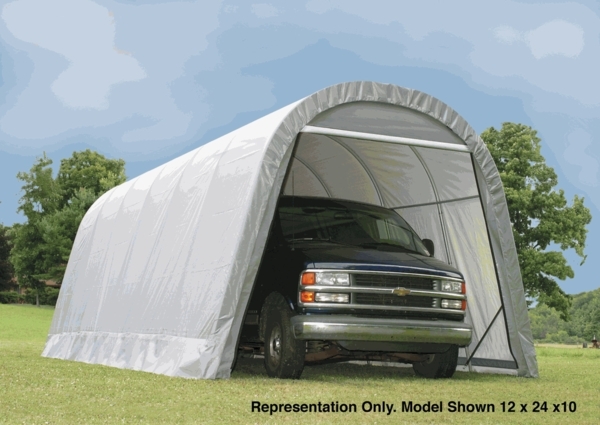 The canopy can withstand the most severe weather conditions. The footpads on every leg give the unit a sturdy base. The patented tensioning system give the system a tight wrinkle free look. The Shelter Logic 12 x 28 x 10 Round Portable Garage Canopy is UV treated, has added fade blocking agents and added anti-fungal agents. Bought my temporary garage a little late in the year for Michigan. I was concerned about assembly in cold and snow. With a little planning figured out how to build the majority of the unit inside existing heated pole barn and take outside. Had no issues at all with construction, and cover had no issues with cold install. Tarp added so much more support to structure. Two people easily assembled. Looks just like the picture, except mine is now full of cars!! ConsInstructions vague. Need to think through what is needed. Using proper anchoring and tie downs to the trailer the unit has withstood 70 MPH winds and winter snows. Just keep the top clear when weight accumulates. Cover has lasted 5 seasons with removal in hot summers. Does what it was designed for. ProsAccommodated a 28' cruiser on the trailer with not problems noting the tongue of the trailer sticks out the front.